August 11, 2013 Nefer Khepri, Ph. D.
The Stanley Hotel, Estes Park, Colorado. (C) Nefer Khepri, 2013. 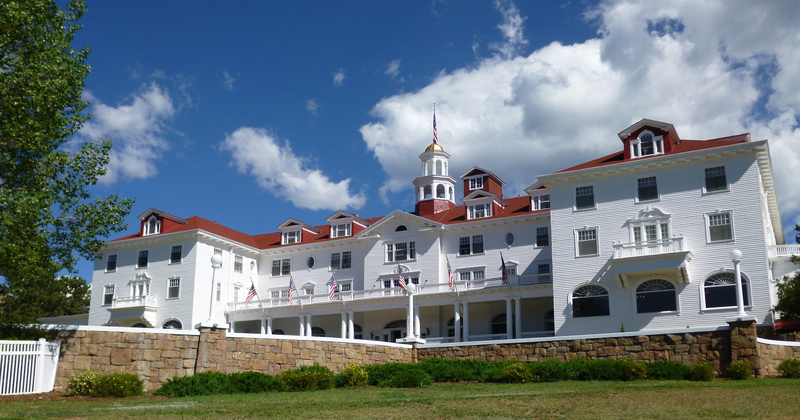 We arrived home from our stay at the Stanley Hotel last night. My husband remarked several times, “best hotel bed I’ve ever slept in anywhere!” So, that’s his endorsement of the Stanley Hotel in a nutshell. Room 426, Stanley Hotel, Estes Park, Colorado. As for me, I agree with him about the bed. I would also say that the Stanley Hotel did NOT disappoint when it came to the paranormal. I caught a lot of orbs and other things with my camera and I haven’t even uploaded the pictures my daughter took, so who knows what her camera may have caught. We shall soon find out. The atmosphere of the Stanley Hotel is quaint. It’s filled with antiques (including a Stanley steam car!!!). There are vintage sepia-toned photographs of the hotel and its guests from back in the day decorating the walls in the hallway as well as the rooms and bathrooms. I loved looking at them and wished I had taken the time to photograph some of them. The rooms are small, however. Please keep in mind if you do book a room there that this hotel is over 100 years old. Back when the Stanley Hotel was built, in 1908 – 1909, people were smaller due to poorer nutrition. I warn you all, if you do stay on the 4th floor, I am not sure about this, but all the rooms may have gabled ceilings that come in at a 45 degree angle near the windows (in some cases) or the back of the room (in our case). Be careful not to hit your head. My husband who is 6 feet tall repeatedly hit his head and my daughter who is 5 feet 3 inches also hit her head (twice). I was the only one who didn’t get a mild concussion while staying in room 426. 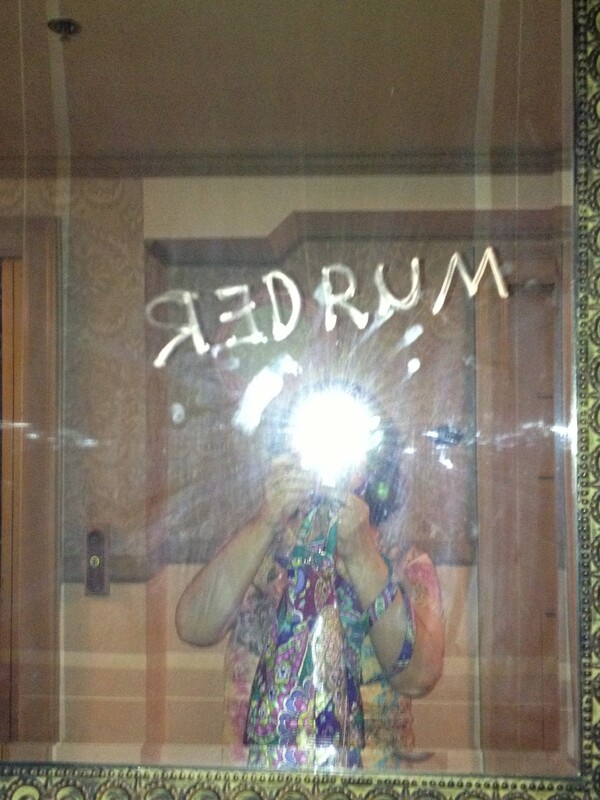 REDRUM on the mirror, 4th floor, across from the elevator. Stanley Hotel, Estes Park, CO. 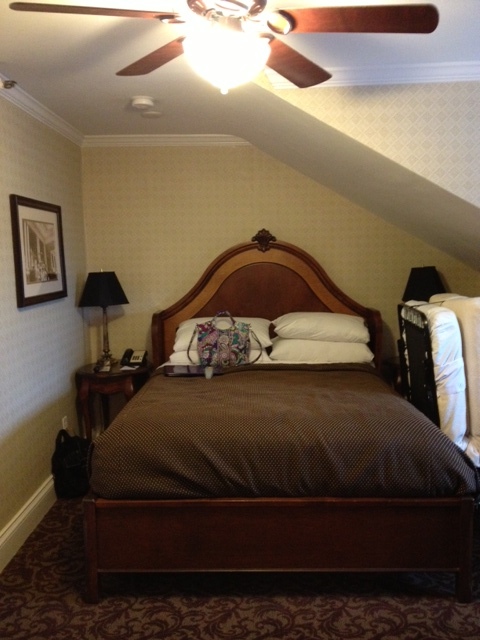 There is an antique OTIS elevator that serves as the only elevator for the hotel. We loved riding in it and could easily picture an old timey elevator operate working the hand crank. It was only crowded twice, both on Friday when the Stanley Hotel has additional people due to those who come in for the tours over the weekend. For an OTIS elevator, it moves quickly (I’ve been in others in Europe that took forever). At one point we got a HUGE laugh when we saw someone had taken some red lipstick and had used it to write the infamous, “REDRUM” word from The Shining on the elevator’s mirror. At one point someone also wrote it in light pink lipstick on the mirror just outside the elevator on the 4th floor. Again, it was good for a big laugh. The staff of the Stanley Hotel are friendly, polite, and helpful. Pillows, towels and room service were all delivered to our room within 15 – 20 minutes by staff members who did NOT hold their hand out for a tip (I’ve stayed in places where they do that & it’s so annoying!). Some are willing to speak about their paranormal experiences while others are not. I even found two people who claim the Stanley isn’t haunted at all, that it’s just all for show! They must not be very observant at all. I showed one of them my pictures and I could tell she was genuinely freaked out by them even though she worked hard not to show it. Prior to booking our stay at the Stanley Hotel I read a lot of online reviews complaining about the noise during the night from people walking the fourth floor taking pictures and carrying out their own investigations. This was not a major issue for us, although one of the tours does stop right outside Room 426, which is where we stayed. At one point a tour group was outside our room after we had returned from hiking at the top of Trail Ridge Road in the Rocky Mountain National Park. We heard all this noise & my husband, who was shirtless at the time after having just showered, was going to open the door to see what was going on when I quickly reminded him it would be a tour group. He then laughed and said, “then I really SHOULD open the door to give them a REAL scare!” That made me laugh. The noise at night didn’t bother me and I am a very light sleeper. In fact, the only night I heard anyone in the halls was Friday night. On the weekends the Stanley is full of extra people who come just for the tours, but are not guests staying at the hotel. So the gift shops, Steamer Cafe, and Cascades restaurant are full of people, as also the lobby and other public areas of the hotel. On Friday night I heard someone walking the halls several times. Now, I never did get up to look, but whether that someone was living or dead, I’ve no idea. At one point I heard children giggling outside our room. In that case I did open the door to immediately look. It was around 11:15 PM, Thursday night. I saw no one. We checked out of the hotel Saturday morning. Check out was a breeze. There were small issues with our room (for one, the toilet water runs periodically) and I presented the staff member with a list and made it clear these were NOT complaints, otherwise we would have spoken to them sooner, but just tiny things that needed to be repaired before the next guests checked into the room. She thanked me and was very appreciative of the information. I was truly sorry to leave the Stanley, as was my daughter. We had a great time, have caught some awesome stuff with our cameras, and we definitely want to go back at some point. Our arrival in Estes Park, CO.
I’d like to take this opportunity to send out a great big THANK YOU to everyone who kept us in your thoughts & prayers. The trip was great. We all had a wonderful time. Our flights going and returning home were completely uneventful, on time, and comfortable (thanks go out to United Airlines, also). Everything went well and a family reunion with my aunt and two cousins I hadn’t seen in 33 – 35 years went much better than I dared hope. I met my cousins’ families & everyone enjoyed getting re-acquainted and meeting each other for the first time. I last saw my uncle last in 2008 when my mother (his oldest sister) was dying. 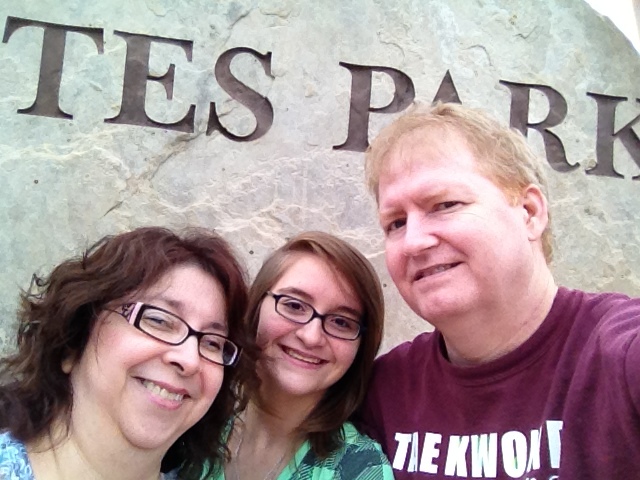 Our original plan had been to go visit him and my aunt where they live in Colorado Springs. 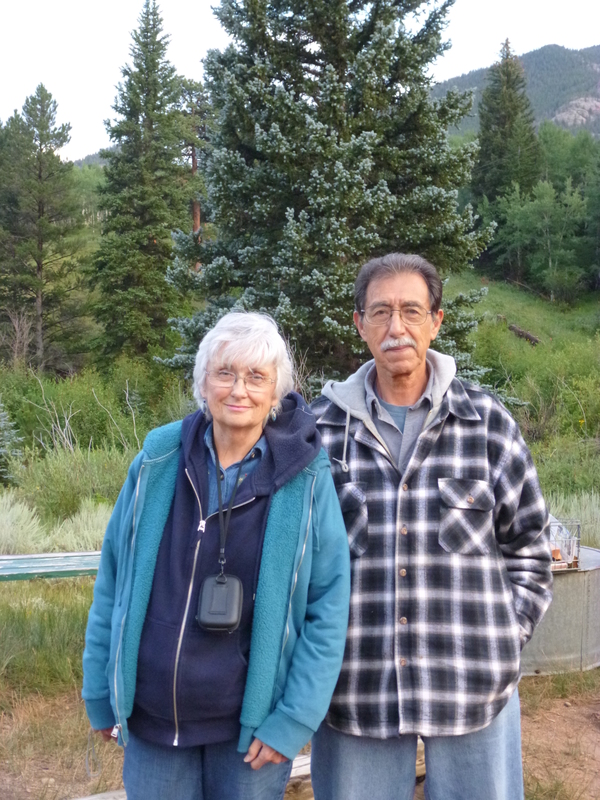 However, with all the summer traveling they were doing we could not come up with a mutually convenient time to visit, then my uncle said, “well, the week of the 5th we’re going to Estes Park. It’s a nice resort town. Why don’t you meet us there?” So that’s how we ended up going to Estes Park for our family summer vacation this year and also how I ended up inadvertently staying at the Stanley Hotel – definitely a dream come true for me. I did manage to do another upload to my laptop of pictures I took on the trip. I also managed to find more ghostly images. Now that I’m home my plan is to transfer them all to my desktop computer. It has a larger screen with higher resolution than my laptop. I’m hoping to be able to see more evidence of the paranormal. As I find things I will be posting, so please be sure to keep an eye on my blog and please also subscribe so you don’t miss out on any updates. 2) the links won’t work and will give people an “Error 404” message. Unfortunately, there isn’t anything I can do about it. For those of you on Facebook, when you see in your notifications I have posted to my blog, you can check the link, but if it’s not working for any reason, please do check back in a few hours. WordPress seems to be taking about 2 – 3 hours to properly publish my blog posts. I have no idea why this is happening & I sincerely hope WordPress can clear up the problem soon. In the meantime, please keep an eye on this space. There will be more to come regarding the ghosts at the Stanley Hotel. Next Archangel Saint Michael: Your New BEST Friend!